Many young men want the muscular physique that signifies masculine strength and virility. They may also be seeking a bigger presence on the football field or more power behind their faster pitch on the baseball mound. But chasing after bulky muscles flexed by professional athletes is akin to the starvation diets favored by young women wanting to look like a super model. Our children are measuring themselves against an unrealistic ideal, and potentially harming their health in the process. With youth comes hubris as well as short-term thinking. What adolescent or even 20-30 year old gives much thought to their long-term health? As we all did, they take their youth and vitality for granted. We all know the drill. The favored method teenage boys use to bulk up involves hitting the gym, hard. Weight lifting tears down muscle fiber. When it rebuilds, the tissue becomes stronger, denser and for males with testosterone, larger. Yet there’s a new piece in the equation – protein supplements, usually in the form of protein powder. Sure, growing boys require a lot of calories, much of it coming from meat. But the thinking now veers toward “the more protein the bigger I’ll get.” This simply isn’t true and is a dangerous way of thinking. We are all getting plenty of protein. 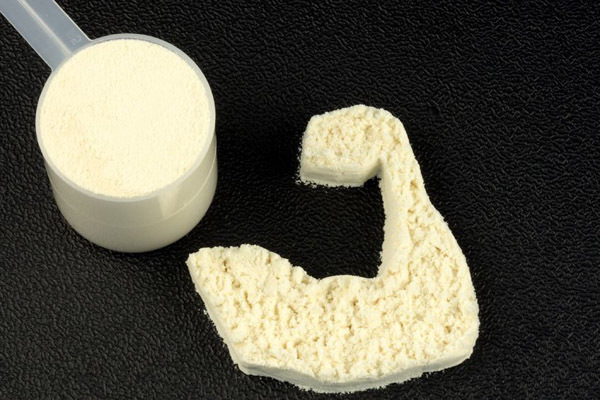 Consuming more protein will not increase the size of our muscles. Exercise is the mechanism that increases muscle mass and strengthens bones. As we replenish the calories burned during exercise, protein from our food provides the amino acids we need for our muscle tissue to repair and grow. According to “International Journal of Sport Nutrition and Exercise Metabolism,” protein should make up 25 percent of your daily calories, which translates to 136-170 grams of protein per day for a 150-pound person. If you’re an endurance athlete, you’ll be consuming more calories, but the ratio of protein to overall calories remains the same. Protein powders are highly processed food supplements that can be sold without FDA approval for safety or effectiveness. Whenever a food source is highly processed in order to isolate a single nutrient (protein), the result is a product devoid of most other nutrients, particularly fiber, and one that is high in calorie, particularly when sweetened or flavored. Some brands add fiber back in, but again, it’s usually a processed source when getting your fiber naturally along with other nutrients inherent in that food is the best way to go. The best recommendation I’ve heard from personal trainers is replenishing the body with a protein-rich meal or snack one-two hours post workout, This will maximize your body’s efficiency in using the protein to repair the muscles post –workout. If you’re still a fan of protein powder, I recommend checking out your favorite brand on the app Fooducate. See how it scores for artificial ingredients, processing, added sugars, fiber, etc. If the findings are less than good, see what better options this helpful app suggests. If you are trying to cut back on animal products avoid whey protein (derived from cow’s milk). Try vegetable based proteins like hemp, pea or the Vega Sport brand that mixes various vegetable protein sources. Dr. Joel Furhman recommends avoiding soy protein powders because they are unnaturally concentrated sources of soy protein and are highly processed leaving little of soy’s natural nutritional properties intact. Eating actual soybeans, edamame, tempeh, tofu and unsweetened soy milk are smarter options to obtain soy protein. In response to consuming protein, especially animal protein, our bodies produce IGF-1 (insulin-like growth factor). Early in life, this hormone is crucial to our growth, but once we’ve stopped growing, IGF-1 promotes aging, and has been linked to the proliferation of cancer cells in the body. This is underscored by the growing evidence published by T. Colin Campbell, John McDougal, and Joel Furhman and many others, that animal products are disease promoting. When we eat more protein than our bodies can use, we don’t store it, it is either converted to fat or eliminated through the kidneys. This causes our higher concentrations of calcium to be excreted in our urine, which can lead to lower levels in our bones as well as kidney stones. For all of you trying to make better food choices, I’m excited to recommend Fooducate. In fact, I’ve been recommending the app right and left to friends, family and clients. It’s not only a handy app, but the blog is a good resource for nutritional information. 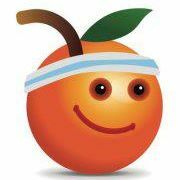 My 13-year-old daughter turned me on to Fooducate, something that indicates just how fun this app can be (the logo is an orange wearing a sweatband). It’s quick and easy to scan a barcode to pull up full nutritional information on a product. It also gives foods a grade (A+ to D) that is devised using an “algorithm that rewards minimally processed, nutrient dense foods with the highest grades.” For foods that don’t score well, Fooducate offers higher-ranking alternatives. I checked out one of my favorite salsas, Kirkland’s organic brand, only to find it gets a B-. Pretty much all tomato salsa are low-calorie, so the low grade is primarily due to its lack of nutritional value – it’s low on Vitamin C. I think I was lured by the word “organic” on the label and didn’t go further than taste in assessing this one. Now, thanks to Fooducate, I’ve got their list of healthier salsa, and I’m having fun trying them out. Fast food fare is abounds on Fooducate, conveniently searchable by chain. A friend was grateful, and a little disappointed, to find out her family’s favorite Jimmy John #9 rates a “D” with more than 900 calories, 2414 mg of sodium (over 50% daily max) and 13 g of saturated fat! The alternatives given were unappetizing, and most rated C+ which probably says a lot about the fast food sandwiches in this category, so I’m thinking she’s decided to split the sandwich with someone or at least indulge less often. The basic version of Fooducate does plenty, but for those with food allergies, or anyone wishing to exclude ingredients like dairy or GMO products, it’s easy and relatively affordable to upgrade to the Pro version. One client finds this indispensable when shopping for her daughter who has gluten intolerance. I was surprise to find out Arizona Green Tea scores a C+, and Sabra Hummus Singles earn a D+! The founder of Fooducate made this video using red Gatorade as an example.